Another afternoon game in which Dodgers were set fair for victory, but where our application in batting let us down. The scene could not have been more perfect: playing the venerable Roehampton Cricket Club (founded 1842, no less) on leafy Putney Heath in the June sunshine, with swifts and parakeets swooping overhead. Some Dodgers had even managed to savour the delights of the nearby Telegraph public house before starting the game. Dodgers lost the toss and Roehampton elected to bat. The outfield was still slightly damp from some earlier drizzle, and there was a little cloud cover to help the bowlers, plus a pitch with some unexpected bounce. 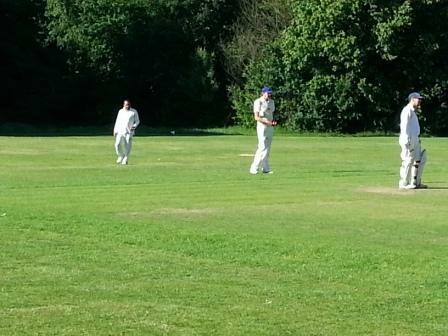 Roehampton were pegged back by line and length from openers Gray and Sood, and only Hatteea (playing against Dodgers, for once) looked secure at the crease as wickets began to fall around him. This sense of security was boosted by TQ's kindly refusal to catch Sacha on two occasions, but when Dollin stumped him off a cunning wider one from Hilary, the Roehampton innings sped towards a premature end. Special mention must be made of Sood's young daughter Nicole, who fielded excellently on the long off boundary and saved us at least 15 runs over the course of the game. A total of 136 looked far short of what was necessary, and we repaired to the Roehampton club house for tea in good heart. The Dodgers innings started well enough, with Dollin and McBarron scoring steadily. Yet just as Mike looked to be opening up for a long knock, he was out to a good 'un. Before you could say "moral fibre", each one of our top order batsmen came and went in quick succession, with only Phil showing the sort of staying power needed in an afternoon game. Saurabh, Shimoga (NJ) and JH connected with one or two in reaching double figures, but it was not enough. We were all out 20 runs short, with two and a half overs to spare.